A timepiece that has been produced in your year of birth, seems to be an all-time favourite wish for many watch collectors. I’ll have to admit that I once almost pulled the trigger on a Speedmaster Professional from my year of birth (1977). However, after a phone call to the seller in France to discuss last details, it seemed that this watch was not made in 1977. One of the inscriptions on the inside of the case back clearly stated that this watch was produced in 1978. Bummer. I can have more luck with a Rolex from my year of birth, however, the prices of these vintage beauties are becoming annoying. 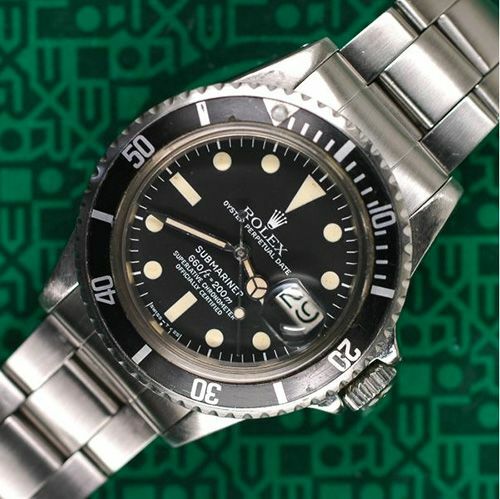 Just a few days ago, I noticed that ‘friend of the show’ Henrik over at SubGMT has a Rolex Submariner ref.1680 for sale, produced ‘around’ 1977. The ‘around’ bothers me of course, but I assume this can be sorted out. According to the website SubGMT, everything about this watch is original except for the bezel inlay. The pearl of the inlay looks indeed more white than the hour markers or hands. I couldn’t care less to be honest. More important to me are the polished edges on the lugs and their sharpness. The folded ref.9315 is original as well, and looks fine as far as I can see on these pictures. These old folded bracelets will make people hear you coming from 200 meters distance (instead of the 50 meters with new bracelets ; – ) ). All part of the charms of owning a superb vintage Rolex. Although its price of 4650 Euro seems to be fair, in my opinion it is still a lot of money for a watch of which its successors are more interesting quality wise. The movement is a Rolex caliber 1570 and can also be found in other Rolex model from that era. 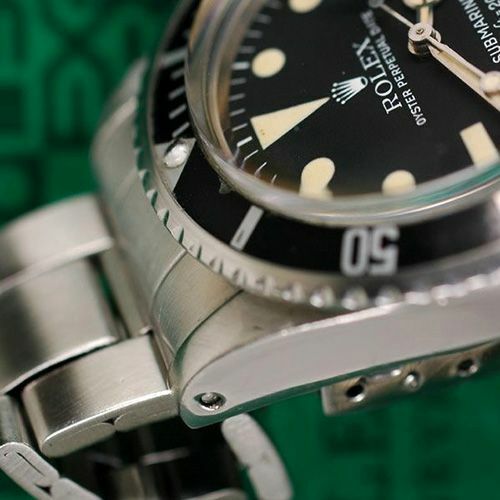 It wasn’t until the ref.16800 Submariner until it was upgraded with a caliber 3035 movement. Although both these calibers are excellent time keepers, I prefer the newer caliber 3135 as it can be found in the later sapphire crystal Submariners (16610) and Sea-Dwellers (16600). This movement has a nicely finished double bridge and a higher beats per hour rate. The folded bracelet I mentioned before, the caliber 1570 movement, the lack of box and papers.. perhaps all reasons that would justify a new sports Rolex for the same kind of money. However, one can’t deny the sophisticated look and feel of a vintage Rolex Submariner, it just breathes history and ‘cult watch’. 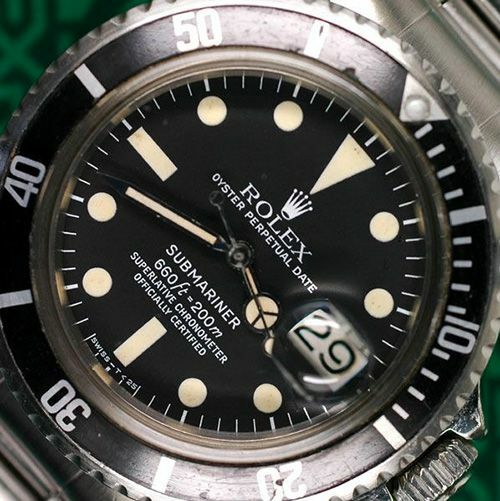 And in comparison to the Double Red Sea-Dwellers, Great White, Red Submariners, Cream Dial Explorer, Freccione Explorers (and so on), the price of this nice and (almost) original ref.1680 Submariner is very reasonable. If it is still for sale around my birthday (13th of April), I might pull the trigger… because in the end, money back guaranteed with these vintage Rolexes.